Quite often when patient complain of constant neck pain, the root cause can be traced back to a stiff C7-T1 junction. 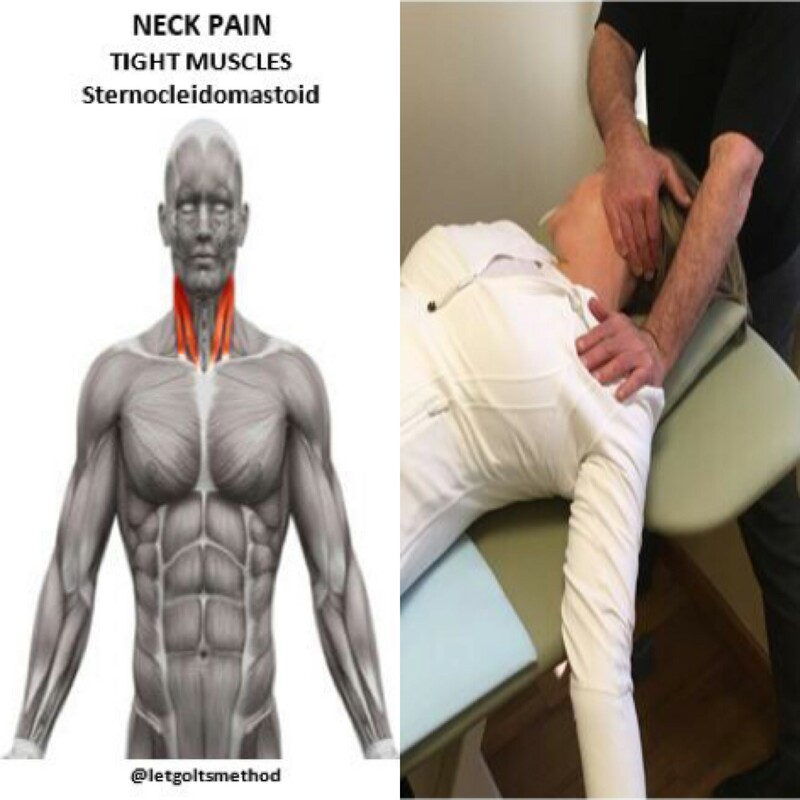 However, the muscles around the neck—sternocleidomastoid (SCM), scalenes, upper trapezius—will tighten up and get locked in as well when C7-T1 becomes stiff over time. Therefore, once the C7-T1 junction is mobilized, the surrounding neck muscles must be stretched and loosened up, otherwise the head will end up stuck in a forward position and the neck pain will return. (1) When both SCM muscles contract, the head is flexed forward, so tightness on both sides exacerbates forward flexion of the neck at rest. When the SCM on one side contracts, the face is turned to the opposite side. Therefore, when stretching out the SCM, it’s important to remember to tilt the head back and anchor the SCM while moving the clavicle and upper ribs downward (inferiorly) to release the muscle. (2) While the scalenes are responsible for forward flexion of the neck, they also elevate the ribs. Therefore, if these muscles remain tight, they not only pull on the cervical vertebrae back into flexion, but also elevate the first two ribs. Since the first two ribs attach to T1 and T2, respectively, chronically tight scalenes will lead to stiffness in the C7-T1 junction that’s likely to spread down the upper back. 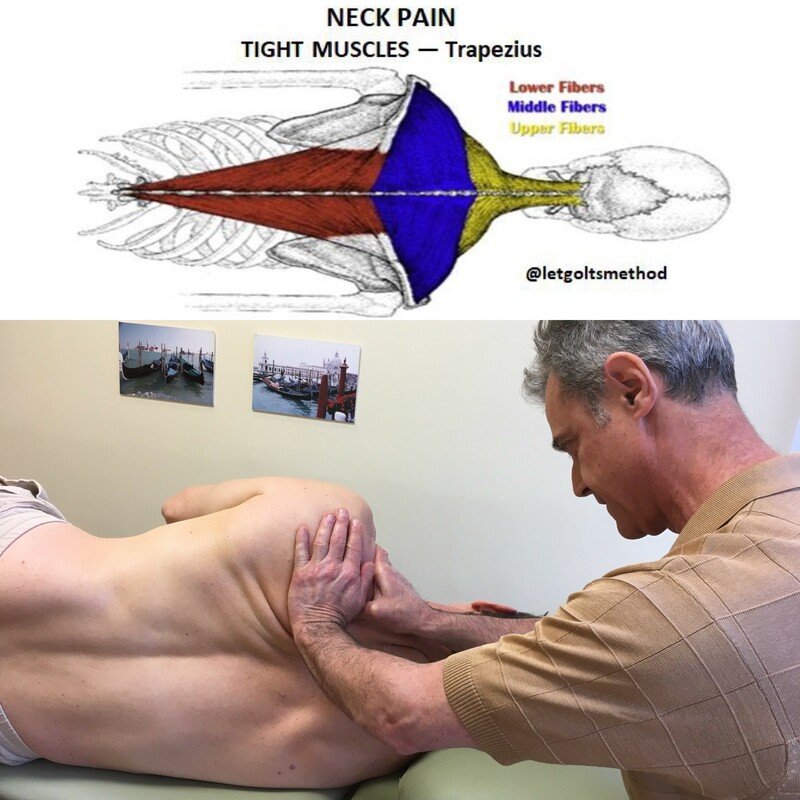 During this mobilization, Dr. Letgolts anchors the inferior portion of scalenes and uses the upper rib rotation caused by the arm movement to increase the stretch. (3) Since the upper traps are primarily involved in the elevation of the scapula, an upper trap stretch is fairly straightforward. However, keep in mind that the scapula should be kept in a retracted position (against the ribcage) as shown, to get a more effective stretch—this would also hit the levator scapulae. Key takeaway: the root cause of someone’s pain is often multi-faceted. It isn’t enough to simply deal with joint stiffness or muscle tightness. As both are very closely related, it must be important to address both issues in order to achieve longer-lasting results.